Last year, I wrote an overview about the obstacles that Asian American women in science, technology, engineering & mathematics (STEM) fields face. In brief, several studies have now revealed that the bamboo ceiling is more severe for Asian American female scientists than it is for men — despite similar graduation rates and qualifications, Asian American women endure greater obstacles towards grant funding and promotions, resulting in profound delays in career promotion within 15 years following award of an advanced degree. This trend is common to most women of colour scientists. Now, a new study by investigators at UC Hastings, Columbia and Emory (“Double Jeopardy? Gender Bias Against Women of Color in STEM“) has shed some light on the workplace environment that women in STEM face, which may contribute to this persistent glass ceiling. A quote from one of the UC Hastings’ survey respondents. In the study (which is worth reading in full), investigators conducted a survey of 557 female scientists, including over 100 WOC scientists. All survey respondents were given experiential hypotheticals that describe instances of gender bias, and asked whether or not they had encountered similar situations in the workplace: 93% of White women, and an astonishing 100% of women of colour — including Black, Latina, Asian, and a single Native woman — reported facing some form of gender discrimination. The survey was posed to interviewees recruited from the Association for Women in Science (AWIS) professional group; while membership in this organization might artificially increase rates at which respondents identified gender discrimination in the workplace, the study was focused also on describing the kinds of discrimination women might face in STEM fields. “Prove-It-Again”: WOC scientists reported being treated with less credibility than their male peers, even when presenting data of similar quality and comprehensiveness. On a day-to-day level, this higher standard leaves women being perceived as less competent than their male colleagues. Tightrope: WOC scientists report feeling like they are constantly navigating a gender tightrope, between being perceived as “too feminine” and “too masculine”. The investigators attribute this to science being perceived as a career that rewards conventionally masculine behaviours — assertiveness, for example; yet, women are expected to perform as traditionally feminine. Practically, this results in women being relegated to punitive or time-consuming support and mentoring roles that draw away attention from research, and women also being denigrated or dismissed as “too masculine” of they display any assertiveness. Maternal Wall: WOC scientists report that one of the most profound forms of gender bias they face is the presumption that they will lose focus or become distracted upon having children. Not only does this produce workplace discrimination in the form of microaggressions, but this can also actively discourage the hiring of women. Tug of War: Finally, WOC scientists also report that gender bias produces conflict between WOC scientists and other female employees. This is related to the fact that WOC scientists who survive the above-described workplace discrimination often are forced to do so by demonstrating their own exceptionalism with regard to other women; this leads to antagonism — rather than collaboration — between female colleagues, and a resulting professional isolation. While these forms of workplace discrimination are common for most professional women regardless of their profession, WOC scientists report that these forms of gender bias can take on distinctly racialized overtones when combined with existing race-related stereotypes. Black women, for example, report significantly higher-than-average experiences of “Prove-It-Again” discrimination possibility related to the intersection of this discrimination with existing anti-Black stereotypes related to academic pursuits. By contrast, Black women also reported they experienced greater tolerance of “assertive” or dominant behaviours — as long as those behaviours didn’t invoke the Angry Black Woman stereotype; all bets were off once this stereotype entered the conversation. For Asian American women, the Model Minority Myth of strong scientific and mathematic competency produced limited advantage, and actually failed to translate into any sort of protection from “Prove-It-Again” bias. Whereas Asian American female scientists reported significantly less “Prove-It-Again” bias from their students or mentees, they reported greater rates of “Prove-It-Again” bias from same-status colleagues (vs White women) indicating that among their peers, Asian American women were still perceived as less competent despite the putative advantages of the Model Minority Myth. The investigators even hypothesize that in STEM fields, the Model Minority Myth may only extend to Asian American male scientists with regard to technical competency. In addition, WOC scientists uniformly reported that “Prove-It-Again” bias often manifested as male colleagues dismissing a woman’s accomplishments (as a product of looks or politics rather than merit) and/or stealing a WOC scientist’s ideas and presenting it as their own. Asian American women also reported significant bias with regard to their assertiveness. 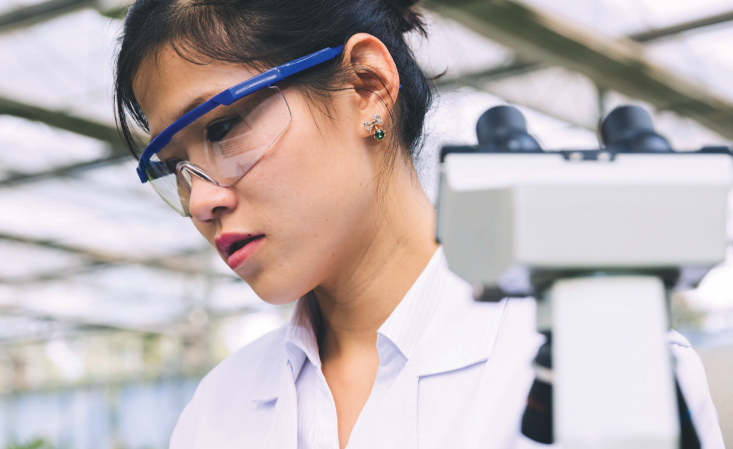 61.4% of Asian American female scientists said that they faced backlash for performing in stereotypically masculine ways, such as being assertive or self-promoting; both behaviours are critical for success in STEM fields. Instead, 40.9% of Asian American women said they were pressured to enact more feminine roles in the workplace, such as being nurturing to other labmates or subservient to their primary investigators; this was compared to 30% of White women who reported similar treatment. Finally, more than 1/4th of Asian American women — the highest of any race — reported being admonished for spending time at work rather than with their children, reflecting the greater expectation that Asian American women should perform more feminine duties such as motherhood. 25% of Asian American women also report sexual harassment in the workplace. This rate was lower than that of White women (37%), but it may be significantly complicated by the fact that sexual harassment and abuse is typically underreported in communities of colour. Meanwhile, WOC scientists also reported the potent impact of tokenism in workplace politics leading to scientific isolation and animosity. Interestingly, female scientists who received a portion of their training overseas in countries report that gender discrimination is worse in the United States than in some other countries, such as India. A quote from a UC Hastings’ survey respondents. I, again, encourage you to read the report in full, particularly with regard to the experiences of Black, Latina and Native women; their stories are beyond the scope of this post but well worth additional contemplation and consideration. In particular, I was struck by how stories of gender bias were similar across all WOC, yet still nuanced by intersections of race. A simple way to keep women in STEM is not to drive them out after they have children. The report concludes that there are several practices institutions can implement to address ongoing gender bias in STEM workplaces, including improving recruitment in the search committee process, assessing gender gaps in start-up package offers, introducing systems for safe reporting of gender bias, and promoting more family-friendly policies to support female researchers. Currently, STEM remains overwhelmingly male-dominated, with female scientists making up less than 20% of all researchers and academics in most fields. Previous Previous post: 5th Annual Korematsu Day is Here!